When people inquire about the development of the Anutra Local Anesthetic Delivery System, I tell them about my father. As a medical anesthesiologist, he would ask, “Why don’t dentists buffer?” I would explain that it is a complex process and just not feasible or cost effective for routine dental practice. Still, it got me thinking. After spending years exploring various options, I developed Anutra as a simple way to buffer local anesthetics — not just in dentistry, but in medicine, as well. Since receiving approval in 2015, Anutra has won numerous awards and has been in the press quite a bit. It is exciting to see the rapid growth and traction Anutra has experienced, and I think the reason for our success is threefold. First, there are not many products that benefit the patient and practitioner equally. This system minimizes patients’ fear of dental injections, and an independent study shows that it adds approximately two hours of chairtime back into the dentist’s day because the buffered anesthesia takes effect so rapidly. Second, this technology is ideal for hard-to-numb patients. Providing effective anesthesia to these individuals not only makes them more comfortable, it also helps dental teams stay on schedule. This makes for a more productive office. Third, Anutra is resetting expectations. As dentists, we have grown complacent with local anesthetic delivery. Anutra has transformed that by showing the industry there is no reason we should be the only health care profession limited to carpules. Additionally, local anesthetic no longer has to dictate our schedules or be a key reason why people fear visiting the dentist. And because buffered anesthetic is so profound, clinicians can use less, which is better for the patient. Plus, the dentist can go to work immediately, which improves clinical workflows. Although many operators believe they are the best at giving a “painless” injection, the reality is, no matter how good our technique, we are still injecting an acidic solution. 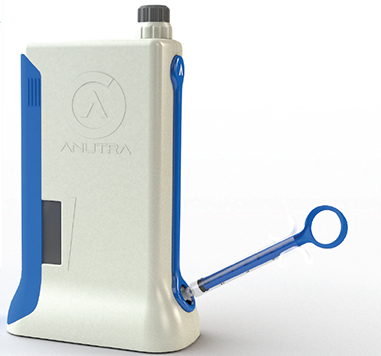 With Anutra, we are bringing the anesthetic up to the body’s pH. Using buffered anesthetic creates a great patient experience and provides clinical advantages, as well. Initially, I used buffering solely to reduce the pain associated with dental injections, but I soon realized that the speed of the buffered solution’s action, improved chairside efficiency, and the predictability of profound anesthesia offers substantial clinical benefits. And the best part? Satisfied patients refer their family and friends. From Decisions in Dentistry. September 2017;3(9):53. Daniel Davidian, DDS, is the founder of Anutra Medical. A graduate of the University of North Carolina (UNC) School of Dentistry, his extensive additional training includes programs in advanced life support skills from UNC, sedation training with the American Dental Society of Anesthesiology, and airway management from The Ohio State University College of Dentistry. He earned his Intravenous Sedation Certificate from the Dental College of Georgia at Augusta University. Davidian was awarded a fellowship from the International Congress of Oral Implantologists, and has been named as one of America’s Top Dentists by the Consumer’s Research Council of America.